I found this piece that I wrote in 2008, and I thought it would be a nice post here for the shortest day and the longest night! 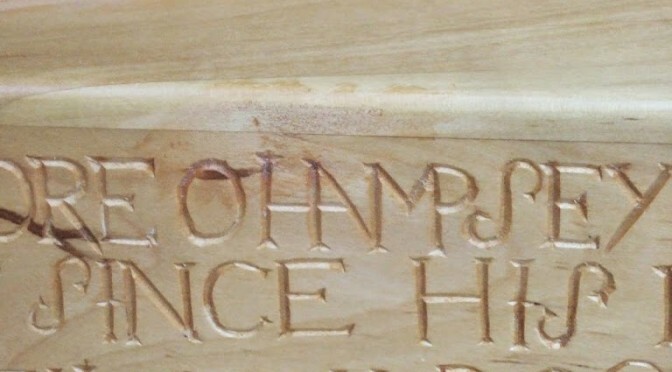 I have long admired the inscription on the front of the Downhill harp: CODEVLIN. I assume C. O’Devlin was the person who originally commissioned the instrument from the maker, Cormac O’Kelly, in 1702. I think it is a great idea for a harper to have their name or coat of arms displayed proudly on the outside of the forepillar of their harp. Other examples I can think of are the coats of arms and initials of Sir John Fitzedmond Fitzgerald on the Cloyne harp, of Robert FitzGerald on the Kildare harp, and the arms of William Archdeacon on the harp in his portrait. There is also Richard Stavan, I think, named on Charles Byrne’s harp in his portrait. 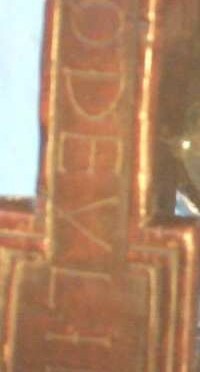 Other old instruments announce their owner’s name alongside their maker’s, such as Rev. Charles Bunworth on the Bunworth harp, and of course the graduates of the 19th century harp society schools had their name written on their presentation instruments, either on a brass plate or in gilt lettering like on Paul Smith’s, now in Collins Barracks. 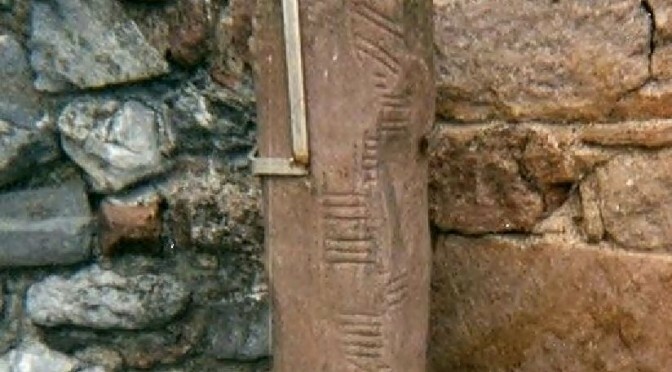 But the Downhill harp is perhaps the boldest, with the name inscribed in big display capitals, slightly wobbly but in very classical style, right on the front where it is most visible. I have also long been thinking about how plain my Student Downhill harp looks, when I use it occasionally for concerts or events. David Kortier has a very clean aesthetic, and his choice of timbers for their visual and acoustic beauty is excellent, but I have more of an antique taste and love decorated and carved things. I have in the past considered painting the whole thing blue or some other such plan, but I can’t bring myself to cover the subtle curl in the timber, which I am sure Kortier selected for me especially. So I decided instead that a homage to C O’Devlin was the best way forward. 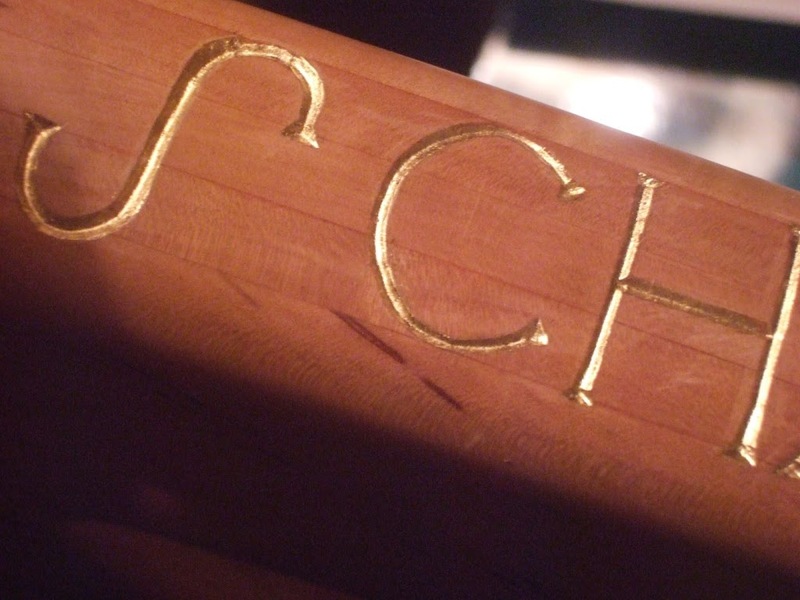 I looked at the elegant ligatures on Cormac O’Kelly’s lettering on the side of the Downhill harp, and I secretly regretted that my name does not have an N in it to reverse. I laid out what I thought was a pleasing design. 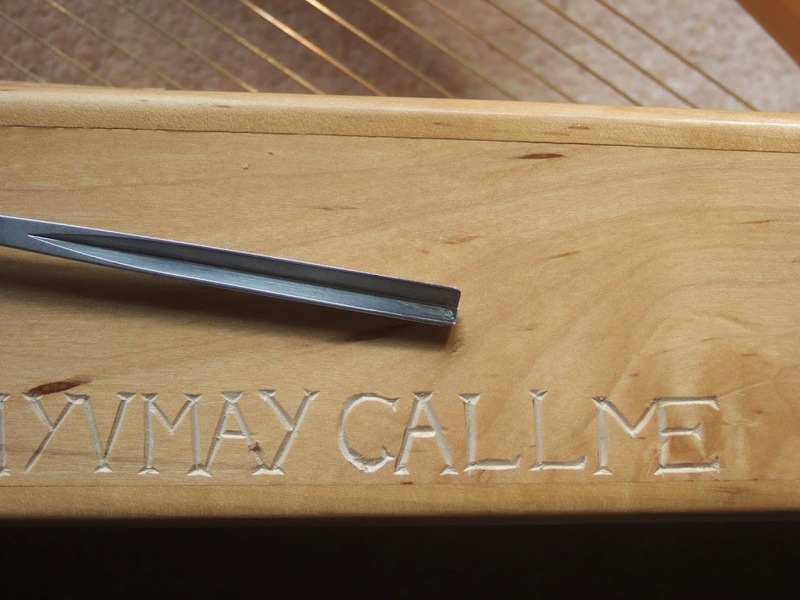 After a careful trial piece in an offcut of the same wood that my harp was made from (thoughtfully provided by Kortier when the harp was new), I carved the lettering into the forepillar. After sealing the cut edges with shellac varnish, size was carefully applied, followed by loose gold leaf. 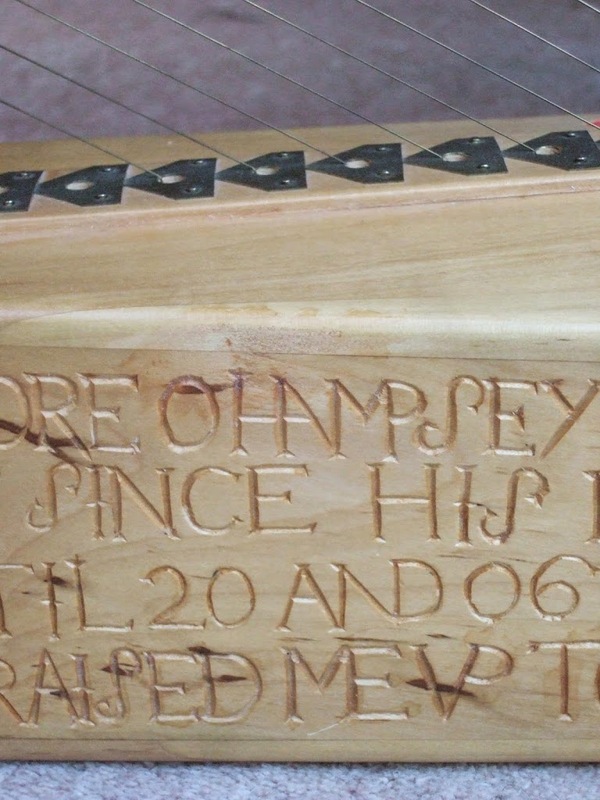 This is the first time I have ever tried gilding, or carved lettering, and I am very pleased with the result.